Good intentions may leave a group of people in hot water with authorities after they painted the historic Askari Monument during the nationwide Independence Day cleanup on Wednesday, December 9. 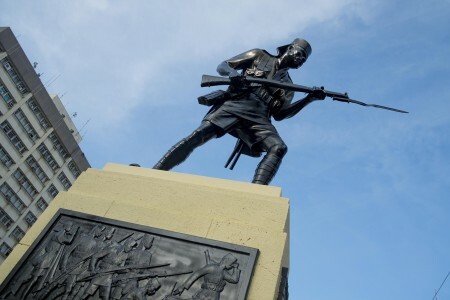 A group of at least four men were involved in the painting of the bronze monument, which has stood in the roundabout at Samora Avenue and Maktaba Street since 1927. 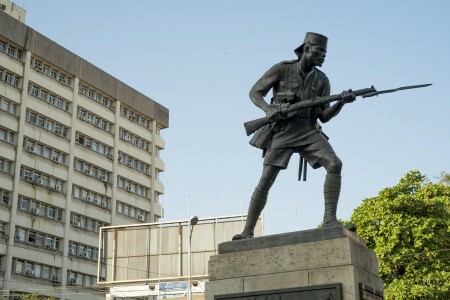 “They went there saying they were doing general cleaning according to the presidential directives and they decided to repaint the monument just like that,” says Simon Odunga, who is leader of the conservation unit at the Ministry of Tourism and Natural Resources. “Painting it another colour is wrong,” says Odunga, noting that making changes to any listed historical structures requires a permit and consultation from the Director of Antiquities. Failure to comply is against the law and his unit is looking into the matter, he says. Odunga says it’s likely that they’ll return the monument to it’s original state. 1 Comment on "Monument painted without approval"
Bronze it must remain. It’ll be better looking if it remains bronze. Maybe nobody polished it and turned black that’s why the people with good intention thought it was black. City authorities should polish the monument as often as is needed.